A white-haired woman with a wise face who looked like the second coming of Grace Paley wished protestors good luck on a recent Saturday in Chicago. 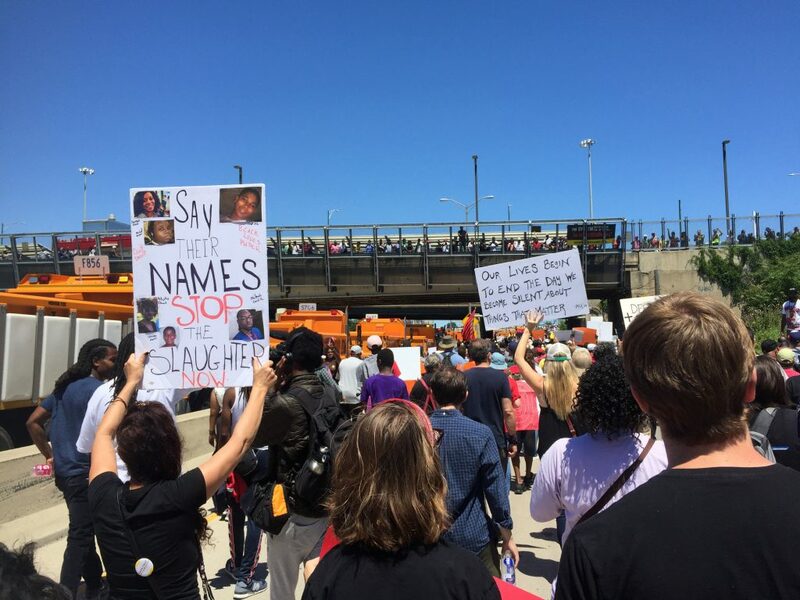 Thousands of us had come to the South Side to help activist Father Michael Pfleger and his African-American parish shut down the interstate highway. Despite threats of arrest, we were focused on common-sense gun laws, jobs, and better schools for the continually challenged area. Seeing the doppelganger of my favorite author-activist felt like an amazing omen. “The only recognizable feature of hope is action,” Paley said. Our highway shut-down in Chicago reminded me that we need to follow Paley’s example of staying true to our most urgent causes–like the absence of effective gun laws that contributed to 199 homicides in our city since January. In addition to illustrating injustice, Paley also recognized the foibles of activists, herself included. Throughout her work, dedicated pacifists learned to combat cynicism and self-righteousness with humor. Marching down the Dan Ryan on Saturday morning, it was possible to feel that hopeful spirit again, even in a time of deep distress for progressives and our nation. Law enforcement did not appear so optimistic at the march. Legions of tense-looking Illinois state troopers and Chicago cops stood ready as we chanted and sang. A fleet of orange snow plows and buses from the Illinois Department of Detention created another border. I understood that the prison buses were meant to intimidate us, but the snow plows puzzled me. Paley might have wondered if they were waiting to scoop up thousands of “snowflake” liberals. The closest our march came to violence was the Twitter-brawl of our wealthy white leaders, Governor Bruce Rauner and Mayor Rahm Emanuel. Though the two have been friendly in the past, now they often squabble and blame each other for failures of stewardship. I appreciated the support of the mayor (who had initially opposed the event), but I saw many more meaningful messages at the march itself. 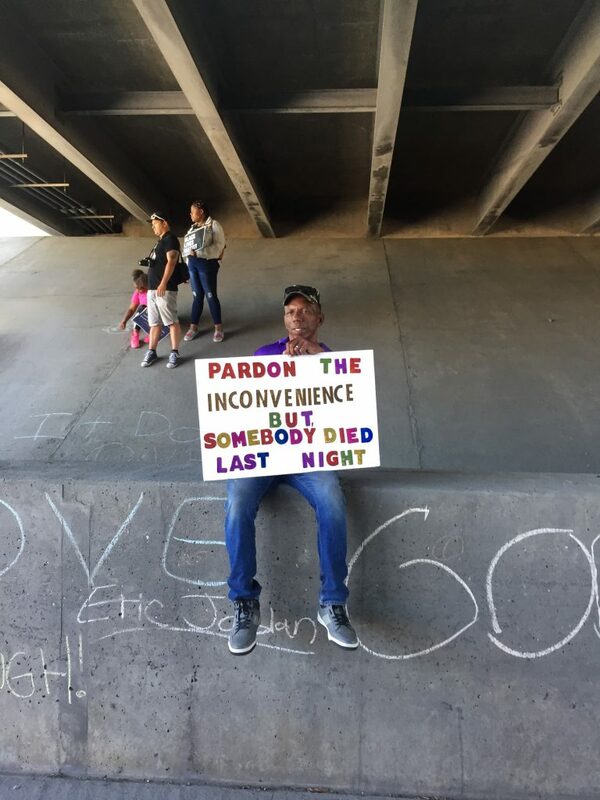 “Pardon the Inconvenience but somebody died last night,” read the sign of a man pausing for a moment beneath an overpass. For most of us, putting a human face on gun violence was only too easy. Photos and names of deceased loved ones decorated signs, T-shirts, and banners. “Say their names,” one poster urged. Personally, I thought about my 17-year-old student Sergio, who was murdered near his home on the Southwest Side. Brilliant and mischievous, he could humble me in a witty way. One day in Freshman English, as I explained the term “esoteric” (not sure why I thought it was so important), Sergio called out from the second row, “Ms. Alessio, you should throw a scarf over your neck when you say that.” His disarming comment could have come straight from a Paley story. During an early, critical moment of the protest, we were stalled for about twenty minutes. Traffic still flowed in two northbound lanes on our left, though the organizers had proposed a plan to occupy all four northbound lanes and achieve a full shutdown. Up ahead, plastic barriers stood angled to steer us off the highway at the next exit, instead of allowing us to continue on to the farther stop outlined by Pfleger and ChiStrong, his group of impressive young activists. Later we learned that Pfleger and the Rev. Jesse Jackson had huddled with the Chief of Police at that crucial juncture. Rauner and Emanuel weighed in by phone (and social media). The whole demonstration might have ended there, or possibly gone in a different direction, though I doubt it would have become aggressive—the Six Principles of Nonviolence were spelled out on the handout distributed by the organizers. We heard cheering, and our crowd began moving and chanting again. Leaving the shadow of the underpass, we poured into all four northbound lanes of the sunny highway, waving our signs. Regardless of the tactical victory, we still risked arrest “and prosecution,” a threat that the governor had been bandying until the day before. I took his bluster seriously, even though he didn’t follow through on it. Before the protest, I had warned a lawyer friend that I might be calling from jail (even though her field is healthcare law). I advised my husband and kids that if I was detained, they were to proceed to our friends’ house for dinner as planned—and to take along the dog. 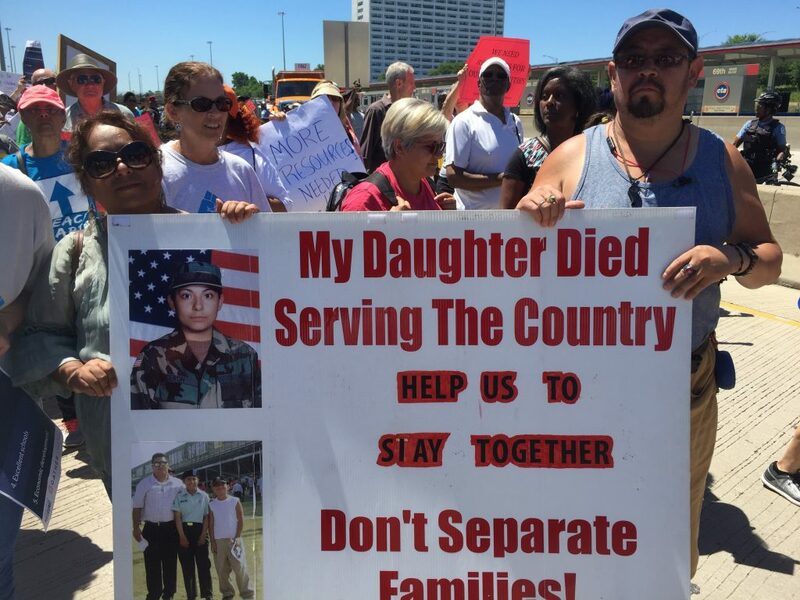 Paley, who was arrested more than once while demonstrating, wrote about the pain of her family’s sacrifices for her causes. She marched for women’s rights, for the U.S. to withdraw from the Vietnam War, and for the abolition of Apartheid in South Africa. In “Six Days: Some Remembering,” the author recalled the time in 1966 that she served in the New York Women’s House of Detention for “sitting down in front of a horse” at a military parade. While behind bars in her own Greenwich Village neighborhood, Paley learned that her young son would not be able to attend summer camp because she had failed to work that week and raise the money. “I burst into tears,” she wrote. In contrast, I had the privilege of considering arrest without similar burdens. My teaching job pays me even in the summer, and my employer is a Jesuit school that encourages nonviolent advocacy for social justice. Nobody in my supportive family missed out on summer camp. But I didn’t fully understand my freedom until the ride home on the El. While traveling north on the Red Line, I sat between two women also coming from the protest. We chatted. The woman on my left, who was in her late 70s, had been arrested for civil disobedience years before, but a pro bono lawyer helped facilitate her quick release and clear her record. I nodded, and said I would be fine with risking arrest (I was vaguely aware that it could also include handcuffs, a hearing, and court-ordered community service.) But the younger woman on my right shook her head and said she would have left the demonstration rather than risk arrest. Other riders looked over at us curiously but we kept talking. On my lap, I tapped a rolled-up poster from the protest that said, “We Need Good Schools.” The three of us may have been separated by age, race, and El-stop destination, but the protest had placed us together to talk. Honest, hard conversations among women were the core of Paley’s writing and life, and I deeply admired her for both. More than twenty years ago, I had the privilege of meeting the author when she came to do a reading at the university where I was teaching. After picking her up at the airport in Atlanta, we were stalled in rush-hour traffic. The elderly author was tired from her trip and easily could have used the time to rest, but she gamely chatted with young, idealistic me for over an hour—about writing, her family, politics, teaching, and even a recent review of her book that had disappointed her a bit. Last Saturday, twenty years later and on another highway twelve hours north, I continued our dazzling conversation. All photos by Carolyn Alessio.